Regular people love everything about big DSLRs except for the "big". Here's Nikon's first crack at taking the sensor from DX format DSLRs and smushing it into a point-and-shoot. Meet the Nikon Coolpix A. How do you get an APS-C senor into a point-and-shoot camera? You compromise on the lens. 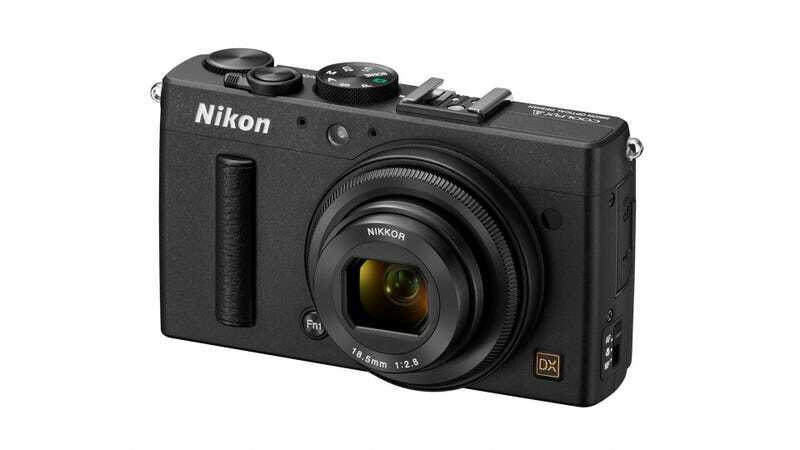 In the case of the new Coolpix A, Nikon's using an 18.5mm prime lens with an f/2.8 aperture. That means no zoom, and you're always shooting at a wide-angle. On the upside, it keeps the camera fairly slim. At 4.4 × 2.6 × 1.6 inches it's quite compact for what it is, but too large for your jeans. At 10.6 ounces, though, it's freaking light. Consider that the D3200 (below) weighs 25 ounces with the kit lens. Both cameras have the same size image senor and most likely very similar image quality. They're not exact analogues, but you could see why someone would sacrifice the zoom lens in order to not have to deal with this hugeness. Nikon D3200 Lightning Review: Where Were You Two Years Ago? The Coolpix A has PASM shooting mode dial on top, and a pop-up dashboard menu on the LCD—exactly like what you'd see on a DSLR. Plus, it's got plenty of additional body controls. We love buttons. Because the sensor is 16.1 megapixels, we know it's one generation old, but it still has solid shooting specs, even by today's standards. It can shoot at a standard ISO of up to 6400 (expandable to 25600) giving you plenty of flexibility. At $1100, it's a tad more expensive than what you imagine an audience of enthusiasts will be willing to pay. We'll see how the Coolpix A handles when drops next month.